Thus the AHA was born—imposing no restrictions or red tape, simply honoring, calling attention to, and hopefully raising community consciousness about the value of our natural and architectural heritage. There’s nothing scientific about our method. Someone nominates an area, and if we feel there is a certain uniqueness, we plan our next AHA. We notify the neighbors, stage a little street party to get everyone together to celebrate, to look around and recognize what a special place we live in. 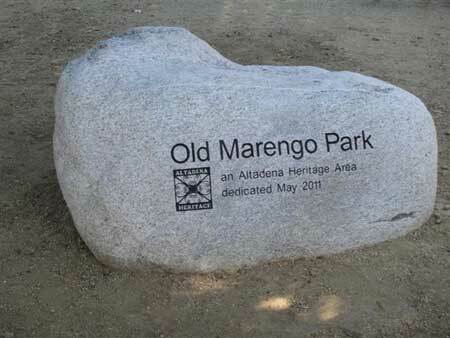 Then we commission and erect a sign designating it an Altadena Heritage Area. 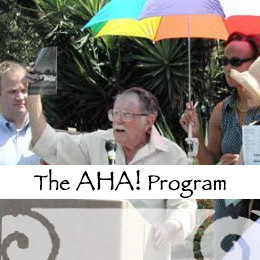 Altadena Heritage dedicated its seventh AHA! — the Equestrian Block — on October 19, 2013, with a community picnic, live music, speakers, and demonstrations of different traditions of horsemanship at the Altadena Stables on Ridgeview Drive. The Equestrian Block AHA! — bounded by Altadena Drive on the north, Casitas on the east, and Mariposa on the south and Hahamongna Park on the west —is “home to a major concentration of horse-owning households, in addition to the century-old Altadena Stables,” said Altadena Heritage chair Mark Goldschmidt. The Altadena Stables is one of two public stables still open in Altadena, and it’s the oldest — having been around since at least 1921 and possibly 10 years earlier. In 1921, it was part of the lavish 6-acre Altadena Riding Academy. After the Academy moved to Flintridge in the 1930s, the property went through several owners until it was rescued from neglect in 1973 by its current owner — long-time Altadenan, horsewoman, and artist Desdy Kellogg-Baggott. The Equestrian Block AHA! actually stands in for all of Altadena’s equestrian past, according to Michele Zack, who gave a brief history as part of the dedication. “Back in the [San Gabriel] Mission days, Altadena was an area for horses put out to pasture,” Zack said. Even though the horse is no longer a main transportation mode, she sees our proximity to the mountains and trails, many large residential properties, and horse-friendly County government as three reasons why horses are still stabled in so many Altadena backyards and even clopping along our streets. The AHA! dedication ceremony featured displays of horsemanship that included English and Western riding demonstrations, dressage, buggy driving, and a spectacular show of Mexican charro riding by members of the Charros Unidos of Altadena. Motoring down Woodbury you may have wondered why in some places homes sit tight to the street while in others they are set well back behind desert areas of dirt. Back in the 1960s the County turned the street into a divided boulevard, trimming entire front yards off some residential properties, tearing down many homes, and leaving bare patches along the way. Tanganica Turner, a representive of Assemblyman Anthony Portantino, presented a commendation for Old Marengo Park. For 40 years an eight thousand square foot patch of compacted soil was untouched except for occasional maintenance doses of weed killer, intermittent guerrilla commercial activity, and the odd broken bottle or abandoned sofa. In 2004 the Altadena Watershed Committee, chaired by Michele Zack, applied with Altadena Foothills Conservancy (now the Arroyos & Foothills Conservancy) for a grant from the Metropolitan Water District of Southern Californian to develop a pocket park on the land to demonstrate waterwise planting and zero runoff techniques. Mark Goldschmidt did the design for Altadena Heritage, and AFC became the sponsoring non-profit. After long palaver with County zoning officials, permission was finally granted and AFC began construction with help from Mountain View Cemetery, the neighbors, and other community volunteers. The idea was simple: to bring the feel of the foothills from Altadenas northern wilderness down to the community’s southern urban edge. A pleasant view for passers-by on Woodbury and Marengo was created, a place to sit and recreate for the neighbors, and a demonstration garden of drought-tolerant native plants for all. The neighbors have become exceptional stewards of the park, and Altadena Heritage has taken over its maintenance with help from the community. 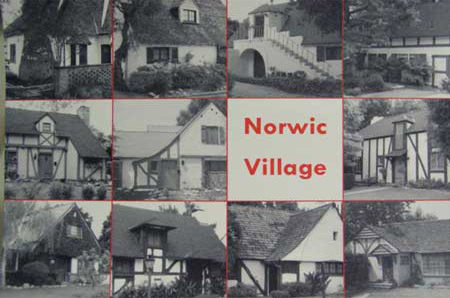 Norwic Place, a little cul-de-sac of Norman style cottages, was designed by architect Wilmer Hershey in 1926. Some of these lovingly detailed homes are much alike, others unique, but all feature high gables, half-timbering, and brick chimneys that combine to form a romantic vision of a European village. The street features a square island in the middle of the turn-around with huge elm and a wishing well. Hershey would certainly be better known today if he had not died at 31. Already he had produced some outstanding work, notably including the Santa Barbara courthouse and a plan for the town of San Clemente. To celebrate Norwic’s designation as an Altadena Heritage Area, we co-hosted a street party with residents: all cars off the street for the day, a Dixieland band, lots of good food, and a special cake. Ivan Hershey, the youngest son of the architect attended and spoke movingly of his father’s short, brilliant career. A grand daughter, Christine Hershey, and a number of great and great-great grandchildren also attended to honor Hershey’s achievement in Altadena. Members of the architect’s family attended the dedication ceremony. Advertising for architect Wilmer Hershey. 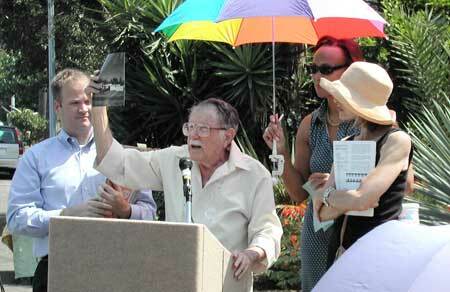 Famed photographer Julius Shulman took photos of Highview homes in 1948 and attended the AHA ceremony in 2003. Highview is a block of homes designed in 1946-47 by architect Gregory Ain, in collaboration with Joseph Johnson and Alfred Day. The design was radically modern, the houses were compact, low slung, and centered on a courtyard with open carports facing the street. They proved to be a difficult sell even though very attractively priced. Today they are treasured by owners. The houses are pioneering examples of efficient, carefully designed modernist architecture with steel framed roofs that allowed large spans and floor to ceiling windows giving out onto gardens. In short, very deserving of an Altadena Heritage Area (AHA) designation. 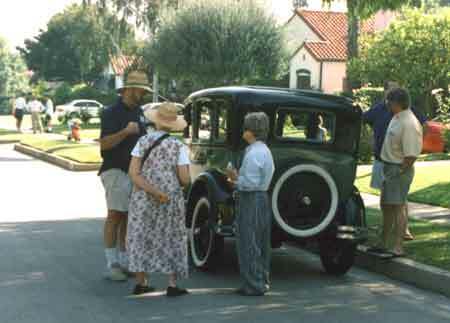 In 2003, Altadena Heritage held a street party and invited famed architectural photographer Julius Shulman, who had taken photos of the project in 1948 for Life Magazine because the design was considered so innovative. Ain’s daughter, Emily, also attended as an honored guest. Julius proved to be a rousing speaker, and told how Ain was labeled a Communist. Ain was no Communist, but he was very concerned with creating community. He would have loved to see the kind of community created here. Shulman then pulled out some 8″ x 10″ prints of Highview he had taken in 1948 and started auctioning them off, all proceeds going to Altadena Heritage. In 1911, Emily Allen, doyenne of the 502-acre Sphinx ranch once covering most of what is now east Altadena, died. The Pasadena-based Hogan Company bought 166 prime acres around Allen Avenue from her heirs. This was the same year that the Altadena Town & Country Club was founded, and its developers called it Country Club Park. Curvilinear streets named after famous golf courses were laid out to take advantage of the contours of the land, street trees were planted, and 180 large lots were platted. No lot had a street frontage less than 180 feet, or a depth of less than 250 feet (though smaller parcels were sold later). In 1920 a sales campaign successfully marketed the development to an affluent class who were attracted to the beautiful rolling terrain with views of the San Gabriels to the north, Catalina to the south, and the proximity of an 18-hole golf course. Many of the pre-eminent architects of the day were called on to design houses there, including Roland Coate, Reginald Johnson, Myron Hunt, and Sylvanus Marston. This became Altadena’s new rich neighborhood, to a degree eclipsing the original Millionaires Row along Mariposa Street west of Lake Avenue where publishing magnates and other Eastern and Midwestern elites had established Altadena in the 1880s as a winter retreat of choice. In 2007, Altadena Heritage declared Country Club Park an Altadena Heritage Area (AHA). The ceremony was coordinated with a tour put on by the Altadena Guild of the Huntington Hospital of some of the many magnificent homes in what the Hogan Company had advertised as the “subdivision of distinction. 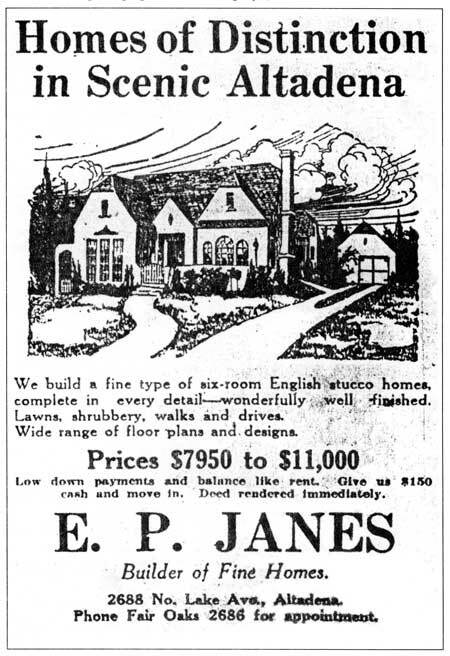 Between 1924 and 1926, a developer named Elisha P. Janes vowed to build a thousand “Homes of Distinction in Scenic Altadena” (as the advertising copy read). He never built that many, but at least 160 typical Janes homes have been documented. 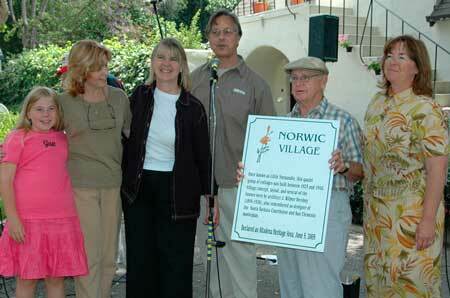 In 2002, we joined with homeowners to make Janes Village an Altadena Heritage Area. Janes Village was defined as an area roughly bordered by Fair Oaks, Loma Alta Drive, Lincoln Avenue, and Ventura Street, though there are other Janes cottages in Altadena. Janes was among the first developers of so-called “mass-produced” housing: he acted as builder, banker, landscaper, and real-estate agent to customers who put $500 down and paid off the the balance at $100 per month. Following the joint block party, Janes villagers got together, formed an association and created a wonderful website. 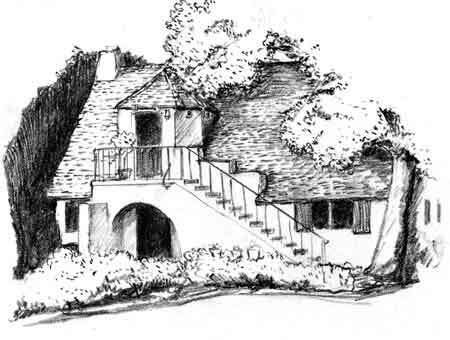 The houses are distinctive, with steeply peeked roofs and arch-topped French doors in Norman style, meant to bring a European timeless atmosphere to Altadena. Our first Altadena Heritage Area was North Garfield, a block-long street running between Alameda and Calaveras Street just north of Mountain View Mausoleum. It was chosen because the 20 small houses on the street, a subdivision built in an old olive grove in the 1930s, represented just about every architectural style then prevalent. You’ll find Spanish to Cotswold cottage to traditional homes on North Garfield. Many olive trees remain from the old grove.